For an impressive number of reasons, WC missed a number of species when trying to count the number of bird species WC has photographed. As a bonus and apology for the errors, WC offers photos of the overlooked birds – not all of them high quality – and some explanations. WC has mentioned that the IOC World Bird List breaks the Fox Sparrow down into four different species, from its original one. WC certainly had two: the coastal Sooty and Interior Red. WC has at least 170 Fox Sparrow photos. After a long, painful and frustrating day of examining photos, range maps, identifying locations based on dates and head-scratching, WC has concluded he has photos of . . . two species of Fox Sparrow. Sooty and Red. No Thick-billeds. No Slate-colored. Sigh. 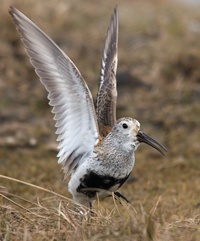 By complete coincidence, WC was in Anchorage when a Terek’s Sandpiper, as Asian species, turned up. The photo isn’t very good, but the classic field mark, the upturned bill, is obvious. The photos was overlooked because it was mis-filed. Two more sandpipers just got missed. Too many photos, WC supposes. There used to be a Northern Goshawk nest on Ester Dome, until a poacher came in and cut down all of the birch trees in which the Goshawk nested. WC had a few, very bad photos taken with an Olympus E-1 DSLR camera. WC thought those photos were lost but, to his surprise, they turned up among odds and ends in an import from Apple’s early iPhoto. Again, these aren’t great photos. Some of them are very bad photos. But the count is photos of birds, not good or great photos of birds. Somehow, WC missed two species photographed this year on his pelagic trip to Northern California. It’s embarrassing; WC really likes Larids – gulls and terns – and it’s awkward to have overlooked two very recent photos of Larids. The discovery of these missing species makes up, a bit, for the loss of Thayer’s Gull, which the IOC lumped in to Icelandic Gull. On of WC’s loon photos was misidentified as a Common Loon; it’s not, it’s a Pacific Loon. Speaking of Larids, a pair of Black Terns nested at Malheur Nat’l Wildlife Refuge this summer; WC got a distant photo of one of them. WC doesn’t count captive birds in his species count. WC didn’t think he had a photo of a Great Grey Owl except for (P)Earl, the Great Grey that lived at WC’s house for many years. Oops. Saw them in the wild and got photos both in Idaho and in Alaska. Back in 2007, WC spent some time with Stuart Healy, who found WC a Spotted Owl. But prior to that, we also found a Ferruginous Pygmy Owl, t the very northerly limit of its range. When WC was labelling photos, this one got missed. Among 170,000 photos, one that isn’t labelled might as well not exist. WC stumbled across it. Something similar happened when WC was at High Island, Texas for spring migration. A Veery is a species of thrush, like an American Robin. So far, all of the omitted species have been North American birds. That’s because North American bird photos are organized – well, disorganized – by the date the photo was taken. But there was one from Brazil that just got missed. Sometimes it is just difficult to tell species apart. This may look much like a Black-necked Stilt, but it is in fact a White-backed Stilt, a related, but different, species. WC saw both species in the Pantanal, but was sloppy labelling photos. So there are thirteen more birds to add to WC’s count of total bird species photographed. The amended total is 1,176. Early next year, WC hopes to add more, but by taking photos of new birds, not my mistakes in counting.